This is PM Modi's first visit to Puducherry since becoming the prime minister. He will first visit the Aurobindo Ashram in the union territory and pay homage to its founder spiritual leader Sri Aurobindo. Puducherry: A day after he inaugurated the pet scheme of Tamil Nadu's former chief minister, J Jayalalithaa - the subsidised scooter scheme for working women, PM Narendra Modi visits Puducherry today. He will be attending attending Auroville's 50th anniversary celebrations. Govt Of Puducherry worked vhard to ensure excellent arrangements for Honble PM's visit to Puducherry. It was the highest point of our career. We thoroughly loved having our Prime Minister amidst us. In a rally in Puducherry, PM Modi has said that he has come to Puducherry after a long time. He said that he felt "lucky to be here". 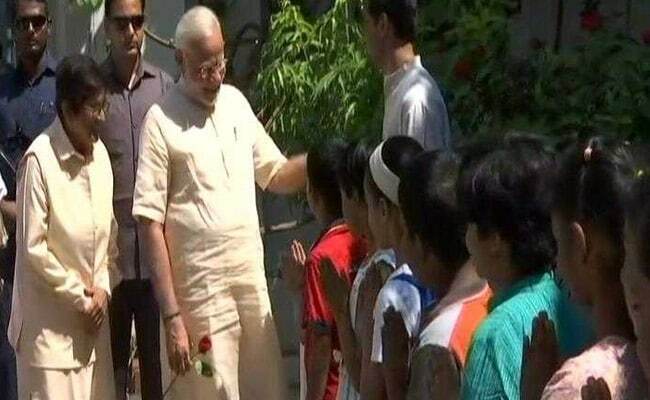 This is PM Narendra Modi's first visit to Puducherry after becoming Prime Minister. PM Modi released the commemorative postage stamp on the occasion of Auroville's golden jubilee. He will soon address a public meeting in Puducherry. Prime Minister Narendra Modi has arrived at Puducherry. He will be attending attending Auroville's 50th anniversary celebrations. He will visit the Aurobindo Ashram in the union territory and pay homage to its founder spiritual leader Sri Aurobindo. This is his first visit to Puducherry since he became Prime Minister.